Please come cheer me on! Cue Rocky music! Austin 3M Half Marathon here I come! If you are still on the fence about whether or not to take the Bosses up on their offer (the one we mentioned here), let’s break this down. If you are thinking of buying a home or refinancing your current one, you will have to have the home appraised. You’ve just earned about $200 per hour. Click here for the map of the medic tents. If I’m going to pass out, it’ll probably happen around mile 11. In that event, all you need to do is e-mail my Bosses and next of kin a snapshot of me on the stretcher sipping Gatorade out of a straw, and the Bosses will still honor that appraisal! Let’s pretend I actually finish this sucker though. In that case – meet me at the Finish Line! My goal time is anywhere from 2:10 to 2:15. That puts me finishing somewhere between 8:45 and 9:15 depending on when I actually get to the start line. I realize most people do not have ranges as goals, but most people aren’t Just the Assistant, and most people are more ambitious than me. Plus, I will know YOU because you’ll be holding a large sign reading “Go Just the Assistant! You’re going so fast!” We will run to one another and embrace and it will just be so beautiful! 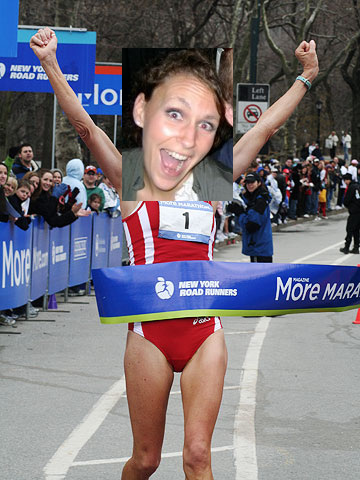 And speaking of the finish line, there is something you need to know about my state of mind when I finish races. Defeated? No. Exhausted? Nope – don’t push myself hard enough. Intense and focused? Not on your life. I am more prideful when I finish races than most Olympians are at winning the gold. My run down the finishers’ shoot usually involves dramatic waves to the crowd, shouts and kisses blown. Every single person there is for me. Usually a loud obnoxious prayer is yelled for the last mile, thanking Jesus for every limb on my body, for my lungs, for my fans. I mean, on a day-to-day basis, none of us are getting cheered for. I for one will take full advantage of the few precious minutes of my life in which people are cheering while looking in my general direction. So, if you’re planning on coming out, please e-mail me today. I am the last person on the planet that still operates a flip phone with no internet, so once I head for Austin Friday morning, I’m off the grid! Or, call my flip phone anytime this weekend – 713.725.1419. You can draw a crowd by telling strangers, “Hey, I’m about to call a person who will be answering with a flip phone!” People will swarm you with gasps and intrigue. Is the Austin 1/2 the same day as the Houston full?